Thailand's far south is caught up in a separatist insurgency that has claimed the lives of 1,300 people in less than three years. In the first of a series of articles from the region, the BBC's Kate McGeown looks at how the violence is affecting local people. 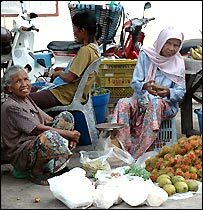 Every day Maikhao Maungrong and Dayoh Daeyo sell their produce side-by-side in Narathiwat market. Over the years they have got to know each other well, whiling away the time by gossiping about their lives. They also share a common concern about the attacks going on around them - the bombings, shootings and other acts of violence that punctuate the lives of people in this region almost every day. "Sometimes, when something happens, I get shocked and scared, but what can I do?" asked Dayho Daeyo. "I'm afraid of the violence, too," added her friend. But there will always be a certain tension between these two women, because Makihao Maungrong is Buddhist, like the majority of the Thai population, while Dayoh Daeyo - like most people in the deep south - is Muslim. The provinces of Narathiwat, Pattani and Yala have little in common with the rest of Thailand. They seem a world away from the well-known tourist beaches of Phuket and Samui, just up the coast, which are full of resorts packed with scantily-clad Westerners partying the nights away. In the far south, most of the women wear headscarves, few people drink alcohol and school children are as likely to learn Arabic as they are English. In fact the ethnic Malay people who make up more than 80% of this region have far more in common with people across the border in Malaysia than they do with other Thais - and this is the source of many of the area's problems. Insurgent groups calling for the emergence of a separate Islamic state first emerged in the 1970s. Fuelled by high levels of poverty, corruption and local gang violence, these groups have returned in recent years with more ferocity than ever. 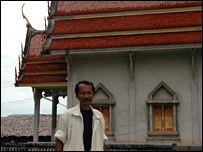 Many victims have been members of the Thai military and police, but ordinary Buddhist villagers are also frequent targets. Yoon Yeunchon, the chief of Sae Khaow, a Buddhist village in the heart of Muslim-majority Narathiwat, says that staying safe is a daily struggle. 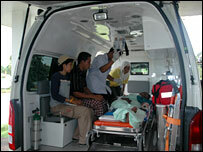 He is not exaggerating - last year seven villagers were attacked, three of whom died. "In truth, we're scared," he said. "We have a rule that whenever someone leaves the village, they should go in a group of at least three and always have a weapon with them." The army recently gave the villagers 20 guns, along with training on how to use them. Kritsanu, a 16-year-old boy, was recently shot six times as he was returning from a trip to town to repair his mobile phone. "We don't know who shot him, but he's afraid they will come back again," said his father Arun Chamnan Kong, who has decided to send Kritsanu to Bangkok for safety. It is not just Buddhists who are at risk, though. Government statistics show that two-thirds of people being killed are Muslim. Militant groups are thought to be attacking locals who do not share their ideals. Research shows that only an estimated 8-10% of people support a separate Islamic state - and fewer still are likely to condone militancy to achieve it. Locals also blame the army and police for some attacks - charges that security personnel vehemently deny. Others say that many deaths are due to personal feuds and vendettas. An incident last September in the village of Tanyong Limo illustrates just how complicated the situation can be. As villagers gathered in a local teashop one evening, a truck came past, firing a hail of bullets at the customers. "Two people died and lots of others were injured," teashop owner Maekyae Maekleh said sadly. But no-one in the village seemed able, or willing, to say who was behind the attack. Nor did they admit any blame for what happened next - the brutal killing of two marines in the local community centre. The villagers maintain that insurgents came into the area and committed the crime. Even now, Tanyong Limo remains tense. One man I met there, Auseng Siariknuk, was shot just a few hours after our conversation. The next time I saw him he was attached to a drip with pins in his arms. "I don't know who did it - I have absolutely no idea," he said from his hospital bed - an answer which was beginning to sound very familiar. With such levels of uncertainty, blame and counter-blame, it is understandable that local people are wary of admitting their suspicions. As well as being afraid of their neighbours across the religious divide, they often fear the security forces that are meant to be there to protect them. "If they see the police or the army coming to their houses, they'll sometimes pretend not to be in," said local peace activist Souriya Tawanachai. Officials insist the situation is getting better, and in some ways it is - with policemen and soldiers attempting a less heavy-handed approach than before. But the mistrust continues, and so too does the violence. More than five people have been killed in the past week alone. As I left Auseng Siariknuk's hospital bed to fly back to Bangkok, his mother held my hands and said: "Stay safe". I somehow felt it should have been the other way round. On Tuesday, Kate McGeown looks at the secretive groups behind the violence, and speaks to an insurgent about his aims and motivations.